Billy Possum’s Interactive Comprehension is a children’s ebook in 25 chapters with dozens of well-thought-out comprehension exercises scattered through the story. Billy Possum’s Interactive Comprehension is a beautifully-created app that will give children hours of beneficial comprehension practice. All features work well and most are very intuitive to use. The questions appear after sections of relevant text, and students cannot bypass the activities to continue reading without interacting with the exercises. The directions to access the hints could be a little clearer, though. The adult documentation indicates that clues and hints are available by clicking on the character, but should also tell users that the hints appear in the text above the question screen and users must scroll back through the story to find the bold-faced text hints. The App Store description also indicates that results can be exported for evaluation and diagnostic purposes, but instructions to access this feature should be in the documentation in the parent’s section of the app itself. One other concern is that the text of the story and questions have a noticeable number of typographical errors, which could be distracting or set a poor example for students. For instance, one question in the chapter 8 exercises has “elaves” within an option. In chapter 10, there is a place in the text where the word “of” has been substituted for the word “off.” Also, there is a discrepancy between the audio levels of the narrator reading the main story and the narration of instruction or correction on the questions. The story is at a pleasing volume, but the instructions are relatively soft and difficult to hear without adjusting the device’s volume. This app truly lives up to its name in terms of the comprehension exercises provided. It is outstanding! In addition to the lower-level, detail and simple inference questions that are usually used for these types of apps, the author has included a large selection of higher-order comprehension skills designed to access processes such as sequencing, prediction and evaluation. This is a refreshing change of pace and very much needed by students. The app presents short segments of the story within each chapter, then has students stop and respond to a comprehension exercise. The segments are long enough to move the story forward yet short enough to help young readers keep track of the action. In addition to multiple choice and sequencing questions, the app also has some visual exercises! Users are offered the opportunity to use a preselected background scene and an array of characters and other items to create a visualization of what has just happened in the story. Visualization is frequently overlooked as a comprehension strategy, so it is really great to see it being utilized so well throughout this ebook. The app has a read-to-me and a read-to-myself mode, and also offers vocabulary assistance in the form of accessible definitions for highlighted challenging words. Teachers will also be very pleased with the hint system for the questions, as it helps children refer back to the story for textual evidence to support answers. And it’s always great to have an app that will record students’ performance, making it much easier to see how they are progressing and to provide evidence-based justification for any remedial lessons needed. 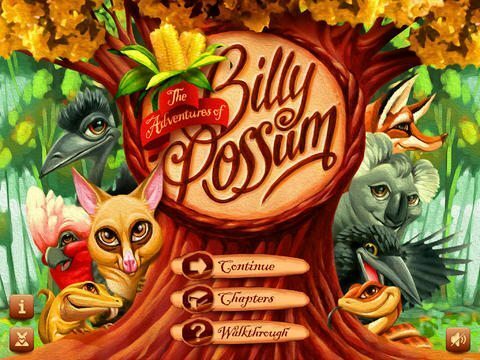 Billy Possum’s Interactive Comprehension is a great story that will undoubtedly engage the audience. The characters are fun and interesting, and the story moves seamlessly through numerous plots and subplots. Children will definitely keep coming back to find out what happens next to Billy Possum and all of the other forest creatures. Since it is set in Australia, the animals are not those that American children are likely to see as commonplace, as they include creatures such as echidnas and koalas. The narration used in the read-to-me version is well-voiced and full of expression, too, which will help younger children stay engaged. This app may seem expensive at first at $9.99, but when you realize that there are literally hours of learning time available for each of several children, it becomes a good investment. I timed myself (as an adult) on the first five chapters, and took over half an hour to get through the content in the first five chapters listening to the read-aloud version. There are 25 chapters, so you do the math! It would be even better if there were a way to manually clear the students’ answers if desired. As is, the questions stay answered, and the only way to allow the same child a chance to replay the story is to open a new account under a different name or to delete the app and start again. Developers may also want to consider making the first few chapters into a free sample so parents and teachers can try the system out and see if their students will engage well with the app. $9.99 is a large investment to make on a hunch that your child will like it. This app is very child friendly. Parents and teachers can rest assured that children will play safely.